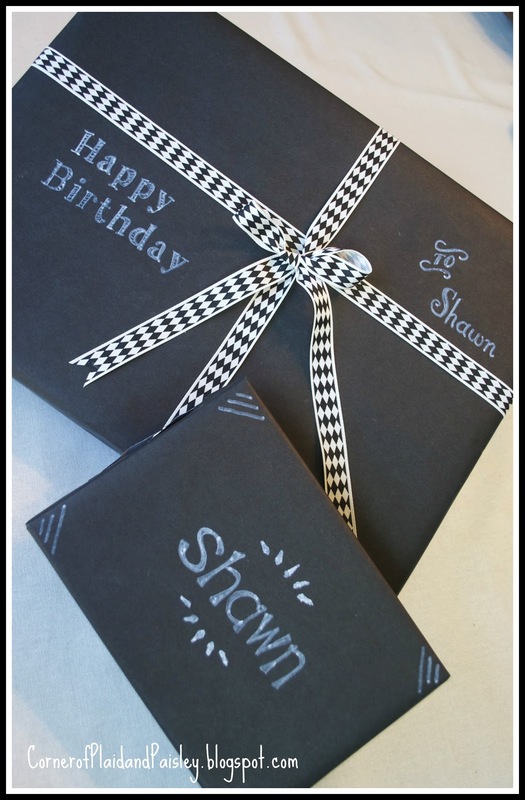 Have you ever wanted to make a gift just a little more special than your usual gift wrap. Using jewelry is a good way to jazz up a gift and take it from ordinary to glam. This paper worked pretty good- it folded nicely and it has a bit of a matte finish. I just used a white paint marker to do the lettering. 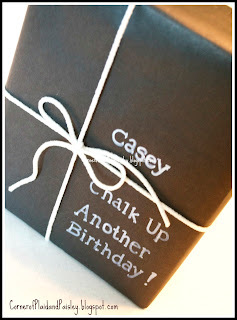 This was all fine for the guys, but when it came time for my daughter's birthday - I knew I wanted to glam it up a bit. So I went for some bling! I found the roll of bling - faux rhinestones at Pat Catans ( I am not sure how many states have Catan stores - it originated in Ohio. It is a very large craft supply store for those of you who don't have one near you!) 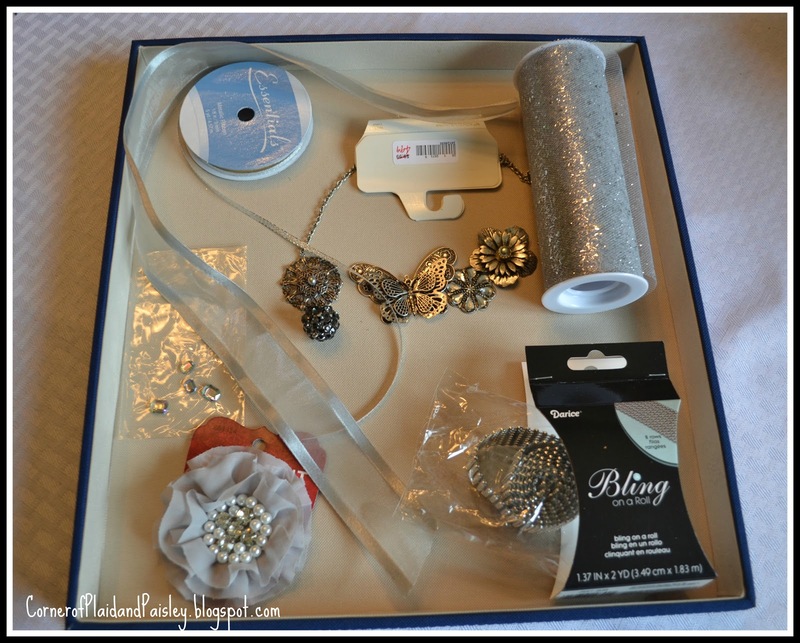 The roll of sparkle tulle, along with the grey rhinestone and pearl flower embellishment are from Hobby Lobby. Then I found this great necklace at Versona ( an accessory store, a lot like Charming Charlie) on sale for $4.99! It had 4 or 5 pieces to take apart and use on different gifts. For the butterfly gift I folded over six layers of the sparkly tulle and cut out a circle from the stack. I tacked them together in the middle with needle and thread, then cut the circle like a pie, just shy of going all the way to the center where I tacked it, fluffing up the six layers a bit. After trying to fix the butterfly on with jewelry glue unsuccessfully, I turned to my trusty hot glue gun - it worked great! This one is my favorite and the easiest! 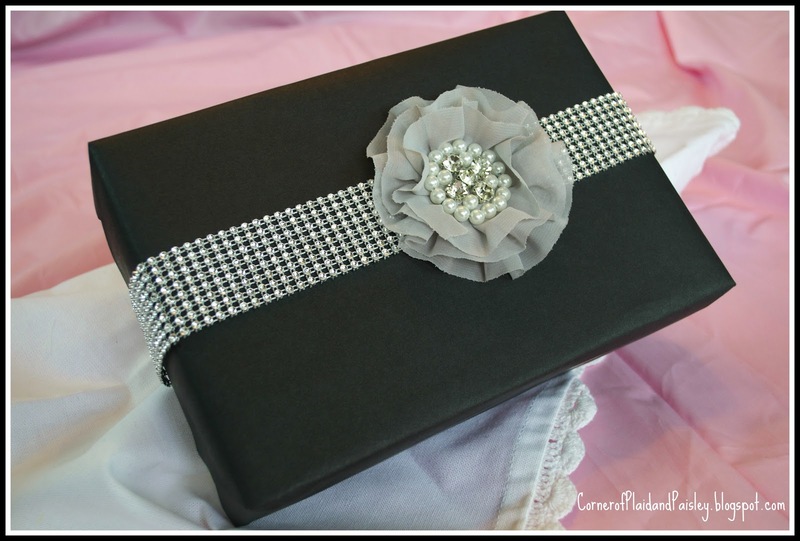 I bought this embellishment cheaper than I could make it- It was $2.99 less my 40% off coupon- so for $1.79 or so I think it makes a great bow. 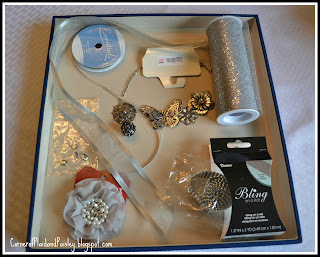 I don't remember how much I paid for the roll of bling but it wasn't that much, something like $4.99 and of course I used a coupon - so this look was less that $5.00 and I have plenty of the roll of bling left for more projects. 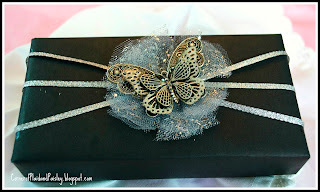 Using recycled ribbon, the flower and a little bit of the chain from the necklace made this package look elegant. I don't think this one photographed as well as it looks in person. I cut out some scroll work with my Cricut and added some rhinestones a the end of the curls. I made the ribbon flower by using a needle and thread to run a gathering stitch along the one side, gathered it up and rolled it into layers to form the flower. 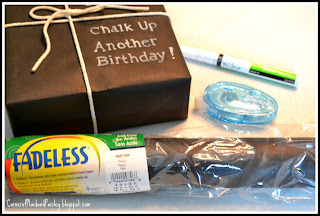 I tacked the back side and then used my glue gun to attach it to the gift. 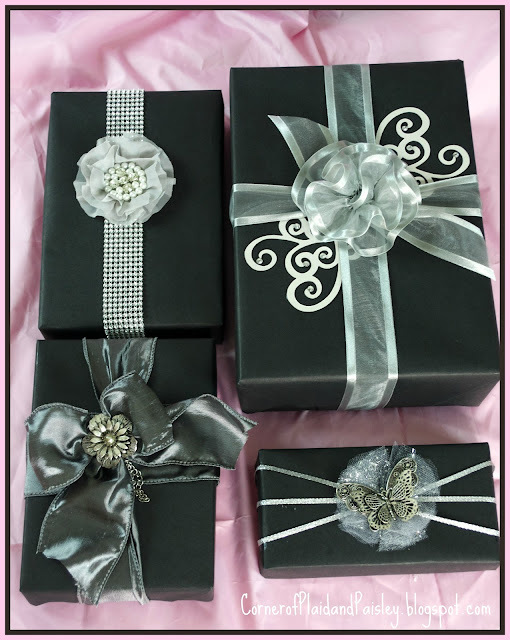 None of these looks cost more than buying a roll of ribbon and a nice bow, but it just adds that little something that says the recipient is special. Wow what beautiful gifts. 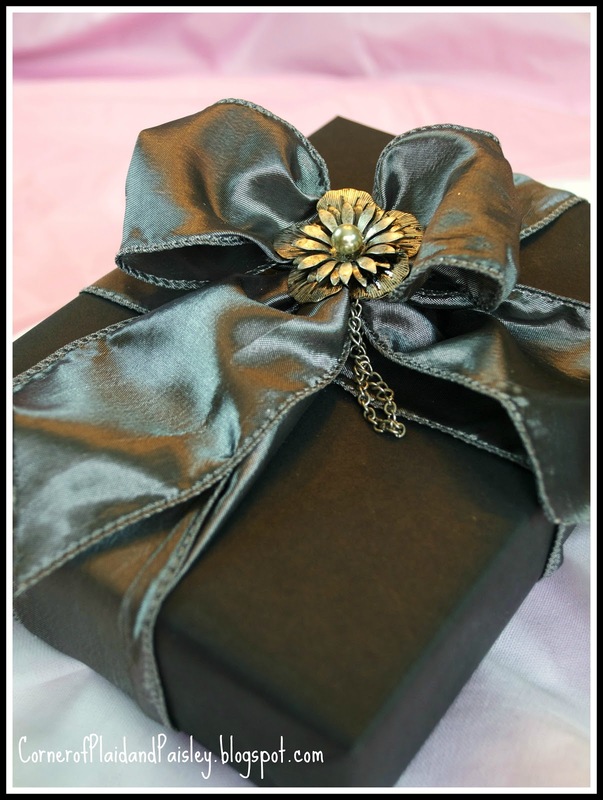 I love to dress up packages and go all out for Christmas. Now I can bling up Bday gifts, etc. Thanks so much for the post. Fantastic! 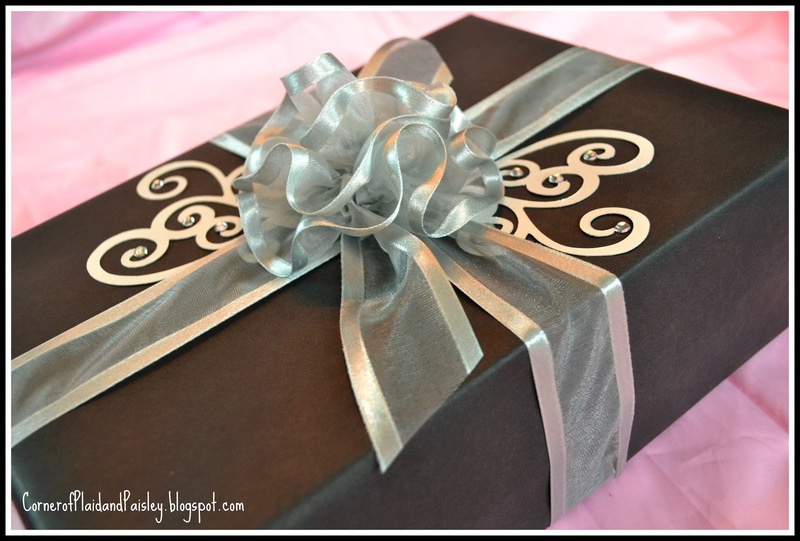 I would love to receive a package wrapped like this. However, I would really have to love someone to give up something this pretty!! Thanks for the inspiration, though!! I am SO going to pin this, Ann! Wow!!!! Beautiful!!! You make it look so easy (both the guys' and the girls' gifts), but I know this took at least a little forethought and work on your part. I'm just bowled over at how pretty both looks are! Oh, wait...I guess guys don't want to think of their stuff as "pretty." OK..it looks so manly! 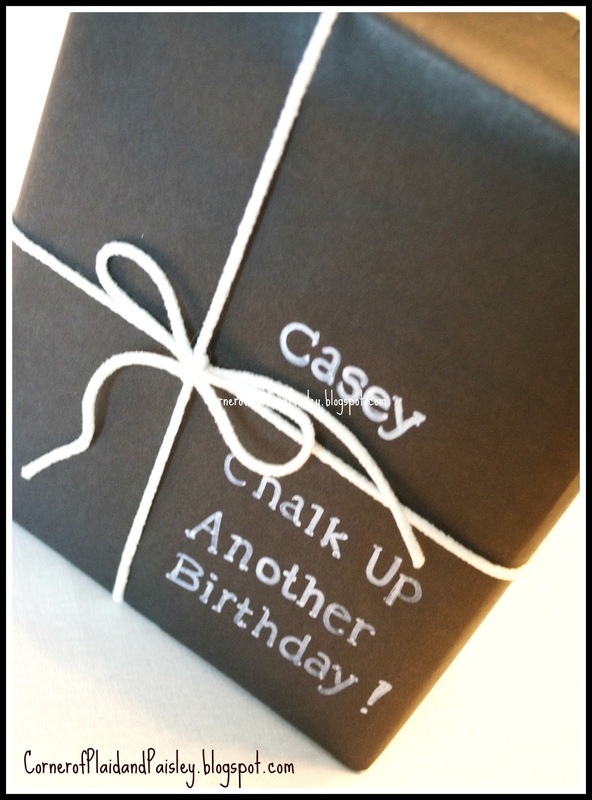 :-) Your hand lettering is very nice, too...so perfect! The jewelry adds so much to those ladies' gifts! 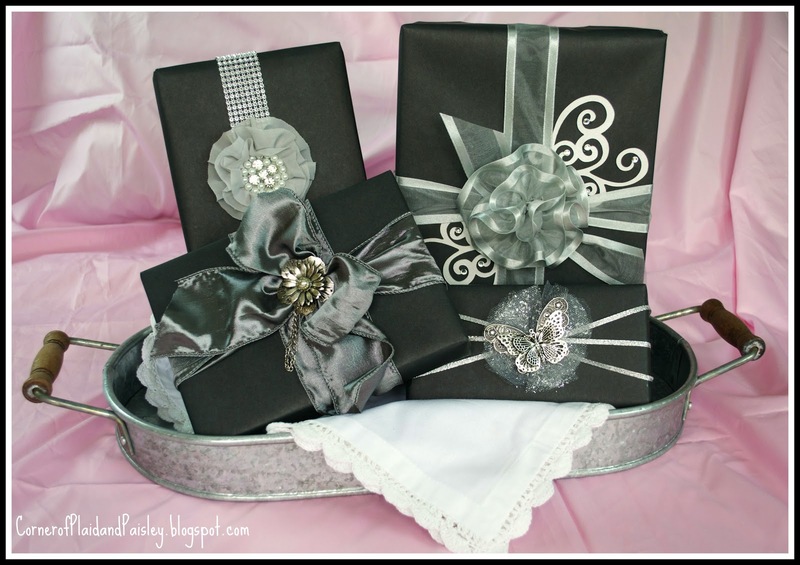 And what a great idea to use the bling ribbon!!! 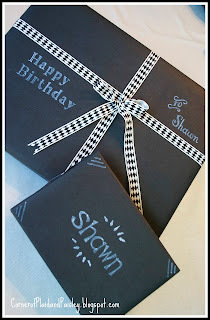 I never thought about buying black wrapping paper, but you have put it on the front burner in my mind now. If you couldn't find it there, I probably won't be able to find it here, either, but I'll at least look. If no luck, I can take a cue from you and go with the bulletin board paper from JoAnn.